Discourse analysis considers how language, both spoken and written, enacts social and cultural perspectives and identities. Assuming no prior knowledge of linguistics, An Introduction to Discourse Analysis examines the field and presents James Paul Gee's unique integrated approach which incorporates both a theory of language-in-use and a method of research. The third edition of this bestselling text has been extensively revised and updated to include new material such as examples of oral and written language, ranging from group discussions with children, adults, students and teachers to conversations, interviews, academic texts and policy documents. While it can be used as a stand-alone text, this edition has also been fully cross-referenced with the practical companion title How to do Discourse Analysis: A Toolkit and together they provide the complete resource for students with an interest in this area. 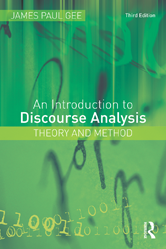 Clearly structured and written in a highly accessible style, An Introduction to Discourse Analysis includes perspectives from a variety of approaches and disciplines, including applied linguistics, education, psychology, anthropology and communication to help students and scholars from a range of backgrounds to formulate their own views on discourse and engage in their own discourse analysis.